Virginia Akers Burton age 83 of Pikeville, Kentucky passed away Sunday, October 14, 2018 at the Parkview Nursing and Rehab Center. 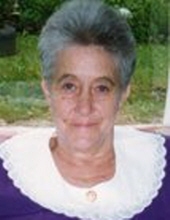 She was a Homemaker and worked at the Mullins Café’ for two years. She was a Christian and a member of the Free Will Baptist Church. She was born on October 17, 1934 at Pikeville, Kentucky the daughter of the late Emmit Akers and Bernice “Vernie” Adkins Akers. Along with her parents, she was preceded in death by her husband, Francis A. Burton and one son, Thomas A. Burton and one daughter, Ruby Jean Burton. She was also preceded in death by a brother, Calvin Akers. She is survived by her children, Emmit S. Burton of Toler, Ky., Nancy C. (Larry) Burgess of Hurricane, Minnie Rogers of Pikeville, Barbara Romans of Hillsboro, Ky, Jacquline Burton of Ohio, Francis J. Burton of Pikeville and Luther Burton. She is also survived by one sister, Emmaline Lambert of Hamblin, WV and a host of grandchildren and a host of great-grandchildren and great-great-grandchildren. To send flowers or a remembrance gift to the family of Virginia Akers Burton, please visit our Tribute Store. Singing Services Tonight at 7:00 p.m.
Services Tonight at 7:00 p.m.
With Estill Reed and others officiating. "Email Address" would like to share the life celebration of Virginia Akers Burton. Click on the "link" to go to share a favorite memory or leave a condolence message for the family.